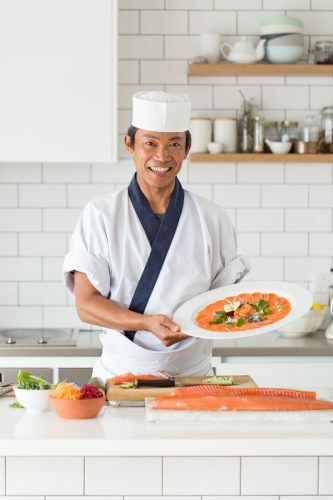 Based just 20 minutes away from the Huon Salmon farm at Hideaway Bay is world renowned sushi chef Masaaki Koyama. Masaaki Koyama only uses Huon Salmon. People from all over the globe travel to the small country town of Geeveston where Masaaki’s quaint restaurant hides. There they’ll feast on expertly crafted sushi and sashimi. Since the age of 10 Masaaki said he knew he wanted to become a chef, catching fish with his father as a boy and making sushi with his grandmother. Today he has nearly 30 years of sushi making under his belt. In an interview with The Daily Mail Masaaki said at first many people in the Geeveston area didn’t know what sushi was. But word soon spread of Japanese chef’s culinary skills. “First I started with seven, then six then four days, but it was too busy I had too much preparation so now I just open Friday and Saturday and do the market on Sunday,” he said. Masaaki proudly uses Huon Salmon at his restaurant and works closely with the Huon team at premiere Tasmanian events like Dark Mofo. To learn more about Masaaki or to visit his restaurant, head to his Facebook page.